I haven’t written in awhile (you can blame 4 finals, 2 graduations, 2 graduation dinners, 2 bouts of the Black Death, and 6 days at a pseudo-Wild West retreat grounds for that), but hopefully the knits that I have for you will make up for the long leave of absence. The biggest complaint that a knitter gets (besides always knitting while the other person is trying to have a conversation) is that everything he/she makes is too warm and is only meant for the winter seasons. And often times this is true, since it’s more common to knit with huge fibers and make warm, plushy mittens or scarves or whatnot. So far, the only viable knitted summer wear I’ve seen have been bikini tops (yes, people make them, and yes, people wear them.). But today (i.e. 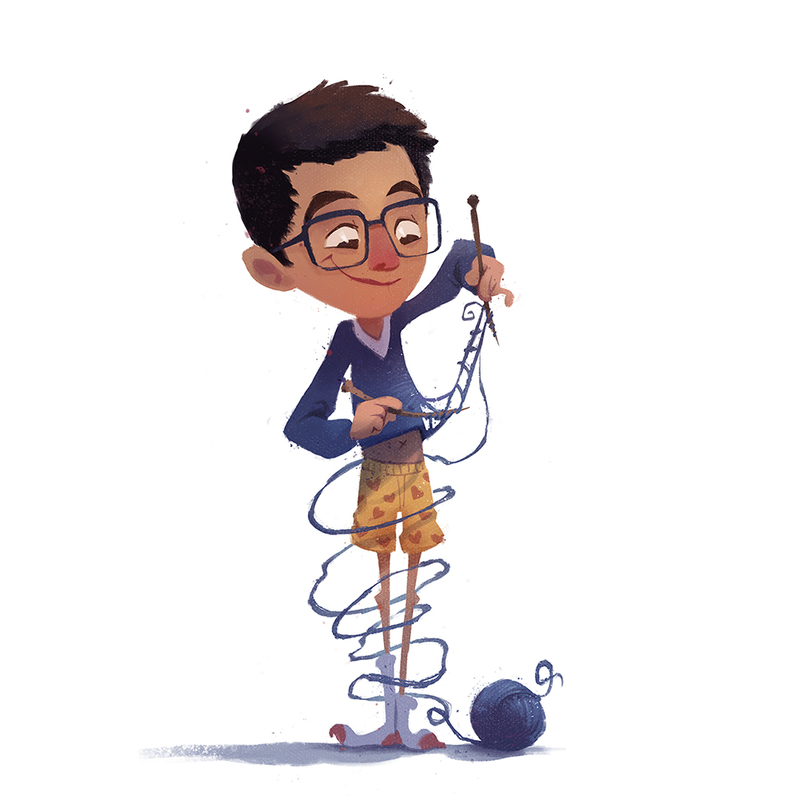 3 weeks ago) I decided to prove to everyone that knitting can be a year-round activity, and that knitted clothing doesn’t have to be restricted to either nice, warm, winter wear or hugely inappropriate summer attire. I present to all of you my very first summer sweater! 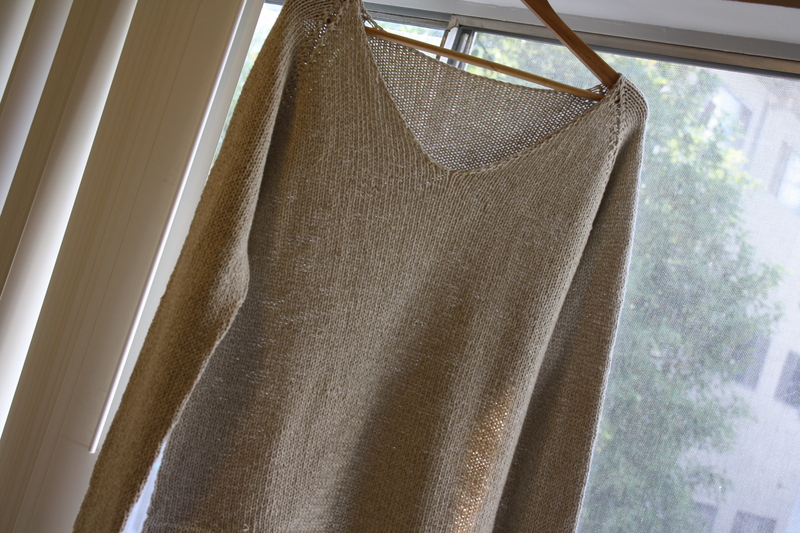 This lightweight, loose-fitting sweater is meant to be worn on breezy, sunny days by a woman already wearing a light tank top or something (I’ve tried this thing on both with and without a shirt. Believe me, this sweater is meant for a woman and conceals absolutely nothing). For those of you scouring the pictures for a subtle pattern or cable, I am sad to say that there is none. That’s right, this thing is 100% plain. 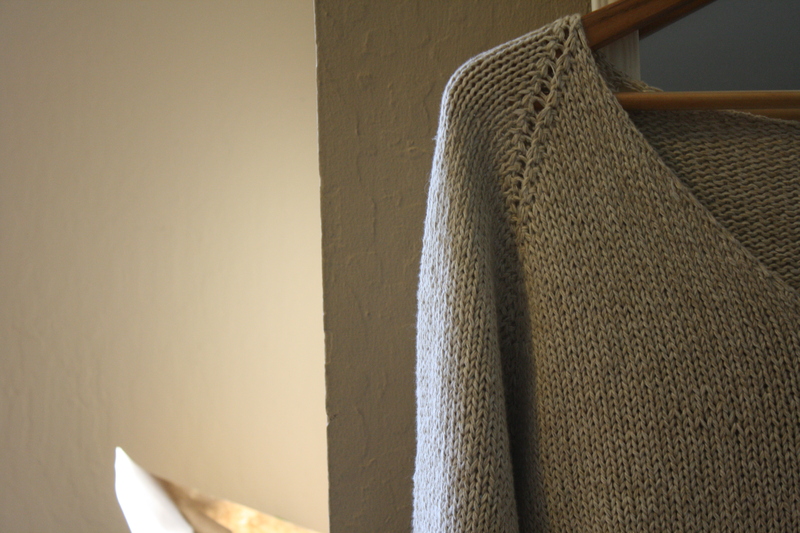 One reason that I made a completely drab sweater is that the majority of the knitting occurred during finals week, when all I really wanted was a mindless project I could do while studying, and this sweater pattern (clearly) fit the bill! Another reason is that there is elegance in simplicity (I realized I’m very good at making insightful comments by following the template: There is [abstract noun] in [longer abstract noun]). 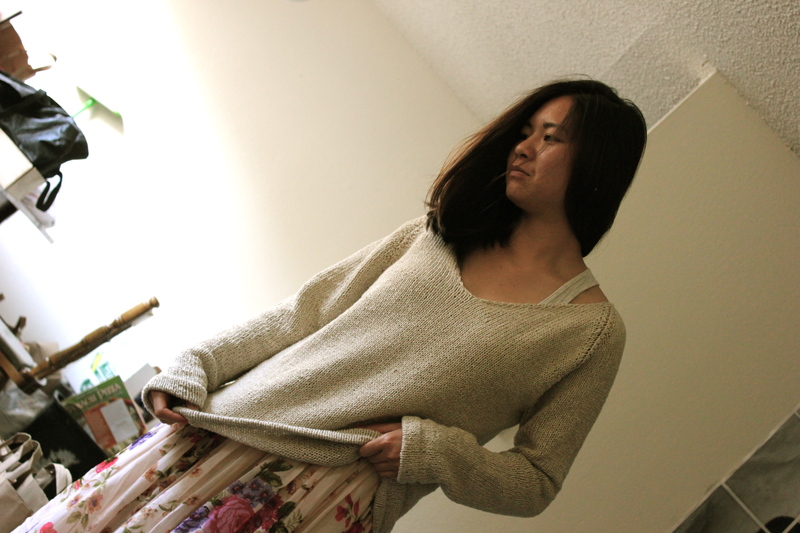 I adapted this sweater from a free pattern download off Ravelry from a woman named Heidi. The original sweater was a tighter fit, had a collar lining, and didn’t have the doubled edging you see on the bottom of the work (see Beanie post for more details). Hopefully the things I added gave the work a more professional and lighter feel. This sweater is the perfect project for any knitter who is tired of making scarves and pot holders and wants to move onto something challenging (and dignified. jk.). You literally just cast on the amount for the neck size you want, and then just knit in a huge circle, increasing for the shoulders and the bust as you go. Also, if loose, baggy sweaters aren’t your style, Heidi was thoughtful enough to include patterns for shaping around the torso to make it a more snug fit. Thanks, Heidi! 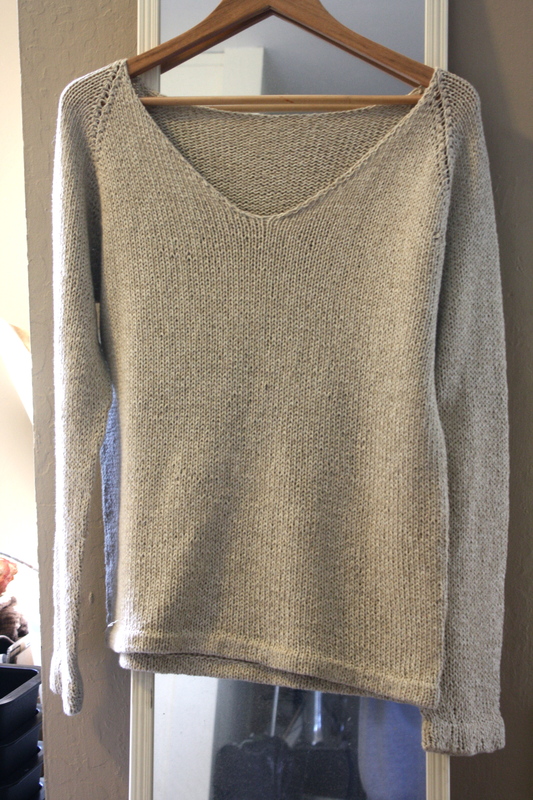 According to the pattern, this sweater is unisex, with the male version having no shaping around the torso. However, I am pretty convinced that no male would be caught alive in this sweater. 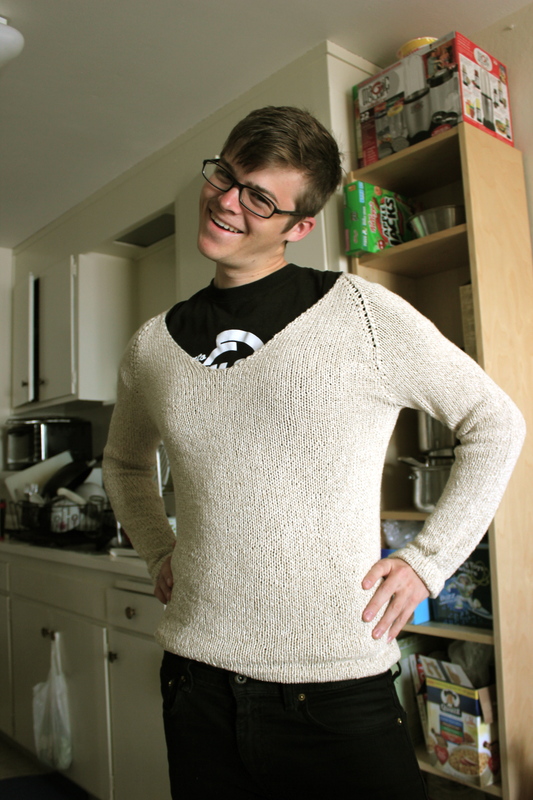 Perhaps it’s how I knit it with the deeply plunging V-neck, but something about this sweater exudes femininity. 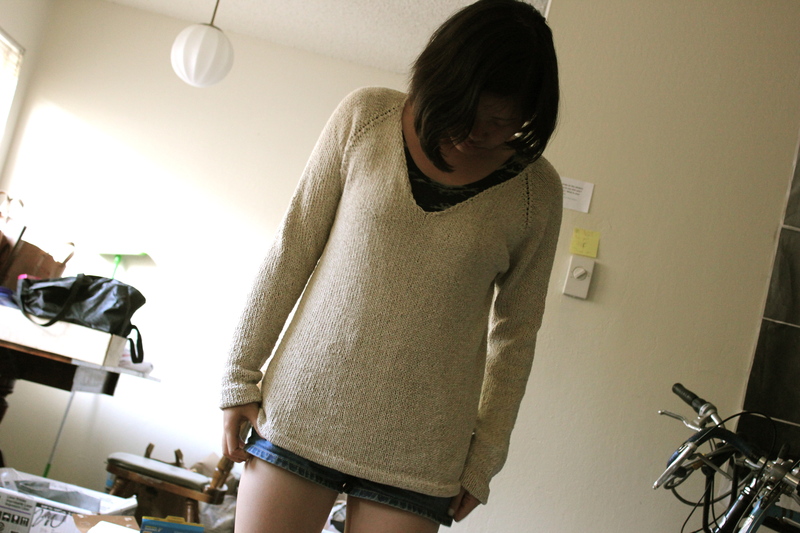 So, to prove the monosexuality of my summer sweater, I had three of my friends try it on. I think we can all agree on who shouldn’t be wearing this. As you can imagine, the inside of this sweater has seen a lot of things, but if you’re interested in having it, please let me know. I’d be willing to sell this sweater for the price of the yarn I paid to make it (~$5. Recycle knitting ftw. And yes, I can pull off saying things like “ftw”). However, if you are a male, I retain the right to refuse and/or nullify any transaction involving this sweater for fear that a fashion catastrophe (e.g. the above picture) may take place. God help us all if that happens. For those of you who follow my blog and/or used to enjoy free Korean food in Berkeley on Monday nights, then you are aware that my Korean roommate recently moved back to Korea to serve in the army. I was greatly saddened by this as I would not have as much time as I needed to teach him to say the word “girl” properly (see English lessons post for more information on my “girl not gall” covenant). So, determined to teach him how to say the name of the entire female gender, I spent the night before his leaving relentlessly forcing him to practice the word over and over again. The following diagram, on the other hand, is the image of my own recording of the word “girl.” As you can see by what is indicated just below the red arrows, F3 starts out lower when I retract my tongue (showing the “r” sound), and then elevates when I extend my tongue back out (showing the “l” sound). See? That wasn’t so bad. You just learned a little bit of phonetics! In all fairness, however, my roommate has improved a great deal with his pronunciations and is, literally, just centimeters away from being able to say “girl” flawlessly. And I commend him for his efforts despite the many voices (or blogs) that seem to only point out his shortcomings. I expect a sound byte in my inbox any day now from my roommate where I can be acoustically barraged with perfect F3 dips and lateral glides. Music to my ears. ***Infants who are born lactose-intolerant are only able to drink their mother’s breast milk if the mother herself consumes no dairy products. The lactose in the mother’s breast milk can be broken down by the body’s natural processes, but lactose of other mammals, such as cows, are broken down by different enzymes, which these infants lack. Is this still up for grabs? I’d love to buy it off of you!